Coffee first appeared in Italy in 1570 in Venice. It was brought there from the East by Prospero Alpino, a doctor from Padua. At first, it was only available to the rich and was sold through pharmacies. In 1716, the first café opened and the drink became available to the public at large. The number of shops grew so that by the fall of the Venetian Republic in 1797 there were more than 200 cafés in Venice, including the famous Florian (1720), Lavena (1750), and I Quadri (1775), all of which are all still open for business. Café Florian in the Piazza San Marco has been serving coffee to Venetians since 1720. In the rest of Italy, coffee met some resistance from the Catholic Church. Some priests felt that it shouldn’t be allowed since it came from the Muslim East and others that it should be banned because of its qualities as a stimulant. Pressed to do something, Pope Clement VIII agreed to try it. The story goes that he took one sip and then said, ‘something this delicious shouldn’t only be available to the infidels.’ The rest is history. Those who have visited any Italian town know that it’s a place where you literally wake up and smell the coffee. At breakfast time the plentiful bars are full of people popping in for their morning shot, a quick read of the paper, and a brief hello to friends. But it doesn’t stop there. People will pop back to the bar, or a different bar, several times a day. It’s estimated that almost a quarter of Italians drink more than three cups a day. And they don’t have qualms about drinking it in the evening. A restaurant meal is usually finished with coffee. Torrefazione Cannaregio, my favourite coffee shop in Venice. People also drink coffee at home, 87% of households using a moka, the metal stovetop coffee maker, again for breakfast, or when friends call, or after dinner. Italy has a strong, and sometimes ritualistic, culture surrounding coffee. Everyone has their own, slightly different way of taking it which is as personal as their signatures. There are unwritten rules about when you can drink what kind of coffee (milky coffee strictly before 11am, for instance). Coffee is part of your social life. Running into a friend in the street, often results in you taking them to a nearby bar to continue your conversation over a coffee. It’s also part of your working life. When arriving for a business, or hair appointment, it’s very usual to be offered a coffee (with the assistant often running out to the bar next door to get it). Demand for coffee has kept prices low. Currently, you’d expect to pay between €1 and €1.10 for an espresso and €1.20–€1.30 for a coffee with milk. At the beginning of 2018, the average price for an espresso in Rome was €1.03. If you are drinking your coffee for breakfast, it’s usual to eat something with it. This will depend where you are in Italy, but a brioche (a kind of sweet croissant), a cornetto (an alternative name for the same thing), or a bombolone (doughnut) are found everywhere. If you are in Naples, you might choose a sfogliatella which is a local delicacy, or in Sicily, a cannolo. In a bar, coffee is often served with a small glass of water. In the north of Italy you will often get a choice of still or sparkling. Somewhere on the bar will also be the sugar. Italians have a very sweet tooth and many think people like me, who drink their coffee without sugar, are a bit weird. The Italian word for coffee is caffè. The ‘e’ on the end is pronounced open like the ‘e’ in ‘get’ and not closed like the ‘ay’ in ‘play’. If you ask for a caffè you will get an espresso. However there are many different types of coffee you could go for, if you know the names. Caffè corretto – an espresso with the addition of a shot of alcohol, usually grappa or sambuca. 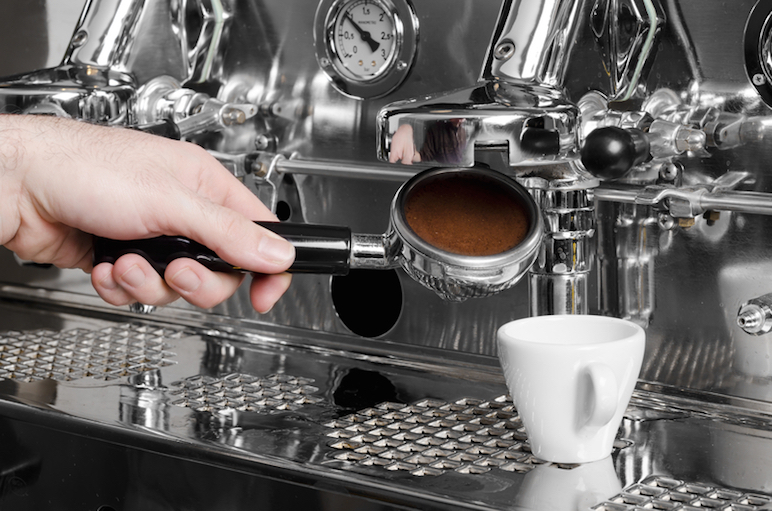 Caffè ristretto – an espresso made with less water so that it really packs a caffeine punch. Americano – an espresso which has been diluted with hot water. This is not an American drip coffee but was developed to resemble it. Caffè macchiato – an espresso with a small amount of milk foam on top (macchiato means marked or stained). Caffè latte – an espresso with warm milk added. Similar to an American ‘latte’ but not the same. If you ask for a latte, beware, as you will get what you asked for: a glass of milk. Cappuccino – an espresso with the addition of foamed milk. Drink your coffee standing at the bar, not sitting down, and don’t linger over it. In some bars, there are no tables to sit at. In others, you may be charged extra for sitting down. Beware, if you sit in one of the cafes in the Piazza di San Marco in Venice, you will be charged a hefty fee for the privilege. But you can still go inside and have a normal priced coffee standing at the bar. Don’t ask for your coffee ‘to go’. The fact that Italians drink their coffee in bars means that plastic or paper ‘to go’ cups are virtually non-existent—which makes the Italian way of drinking coffee more eco-friendly. This morning, 7 September 2018, the first Starbucks in Italy opened its doors in Milan, finally bringing US style coffee to the peninsula. Whether it works or not and whether it will be followed by other openings, remains to be seen. The development has been hailed by some as a welcome addition and slated by others as an attack on Italian culture. I can’t imagine any Italian paying Starbucks prices for coffee, but let’s wait and see. What are your experiences of drinking coffee in Italy? I’d love to hear about them in the comments below. Italy, Portugal and Spain are three countries I’ve been to where coffee is more important than religion. They are listed in order of adherence to the true faith of coffee, the rest of Europe follows on far, far behind! I can remember near Rialto in the late 1980s on my first visit to Venice, there seemed to be quite a few very small places selling coffee where you stood up, drank the coffee and left after only a few minutes. I presume there seemed to be so many because it was an unusual sight for a foreigner like me! True Italian espresso can be too strong for me sometimes. Then I either need to sweeten it or drink it as an americano half, espresso, half water. My late partner was addicted to drinking a doppio anytime of the day or night! I agree! People sometimes say that France is a coffee country, but when I lived in Paris, as an Italian, it was really hard. I like ristretto, personally but I can see how Italian coffee can be too strong for some people’s taste. Thanks for commenting! Today I read that a Starbucks is opening in Milano. I hope it doesn’t last long, and doesn’t spread to other Italian cities. Yes, it opened today. I timed this post to coincide with it. We’ll see what, if any, effect it has. Fingers crossed! You mention a bossy waiter. Against my advice, a friend of ours asked for some Parmesan to go on her prawn and pasta dish. He just said “No” and walked away! Oh dear, but I can believe it. You should see my post on ‘Why Italians go crazy about Italian food’. My Venetian cousin married an Englishman in Venice, and the night before the wedding our family and his family went out for a meal. After the meal the Italians ordered caffè and the British cappuccinos. The waiter didn’t say anything, but you could see on his face that he was having real problems serving it. American expat in Italy here. I can’t tolerate regular espresso (too bitter, even with sugar added). Cappuccino is okay-ish for me, but not what I would have ordered. My favorite Italian coffee all the time is “Caffè Crema.” That drink is like a cross between coffee ice cream and espresso……perfectly delicious, cold, and creamy. It is usually served in a small glass cup. That’s the only Italian coffee I’m willing to drink. I do wish they serve it all year round in most bars, not just during summer time (I like to consume cold drinks, ice cream, and food, even during winter……the Italians freak out when they see me doing that). Luckily, most bars in train stations (Padua and Venice) have this all-year round. You should add that coffee to the list in the above blog post. I’m perfectly fine with Starbucks opening in Italy. They’re just offering different options and experience. I miss their frappuccinos, such as caramel, mocha, strawberry, and matcha, and cold iced teas. These are the drinks you can’t usually find in Italian culture, so I hope they do well and open one in Padua/Venice area soon. HI Sheila, thanks for your comment. I know exactly what you’re talking about and it’s delicious. I wish they would serve it outside the summer months too, but then, seasonality is one of the main things I love about this country, so I guess it’s OK 🙂 I think if Starbuck’s Milan makes a success of it, Venice will be high on their list, so you may be lucky. The” real problem” is when you are travelling to france: firstly, they don’t know how to make a coffee, and secondly they use a different blend, so, also if you add water, milk, or sugar in industrial quantities, it always tastes bitter. Favourite place for coffee is Caffe Sant’Eustacchio in Rome. Enjoyed trying Bicerin in Torino and confused by what was on offer in Trieste — a cappuccino looked like a short black with froth on top. Ah yes, I know it well. It’s a great bar. I haven’t been to Torino since I was a child, but I hear they have a great café culture. Maybe time for a trip. What you had in Trieste sounds more like a caffè macchiato. They do do things differently up there though! Thanks for the great article Luca. After many confusing visits to Italy (including this past weekend in Bologna) with your help it’s starting to make sense. I love the rigid tradition of Italian coffee and food – like pizza when you can’t choose your own toppings. Basically they are saying – this is the right way to do it. You aren’t allowed to mess with it. What do you know. On the subject of Starbucks I believe it will be successfull in Italy as it has been anywhere else. The mistake is to think it is about the coffee. What they are actually selling is a cool hangout spot for young people and hipsters with their #1 need satisfied – good Wi-fi connection! Thanks so much for your comment and insight. I’m glad you found the article useful, Brian and hope you had a great time in Bologna. Tea is very fahionable here in Italy right now. I drink Kusmi a Franco-Russian brand which you can fins easily here. I agree about the prices. They say, however, that the coffee in Milan Starbucks isn’t bad as they roast the beans on site. We’ll see.